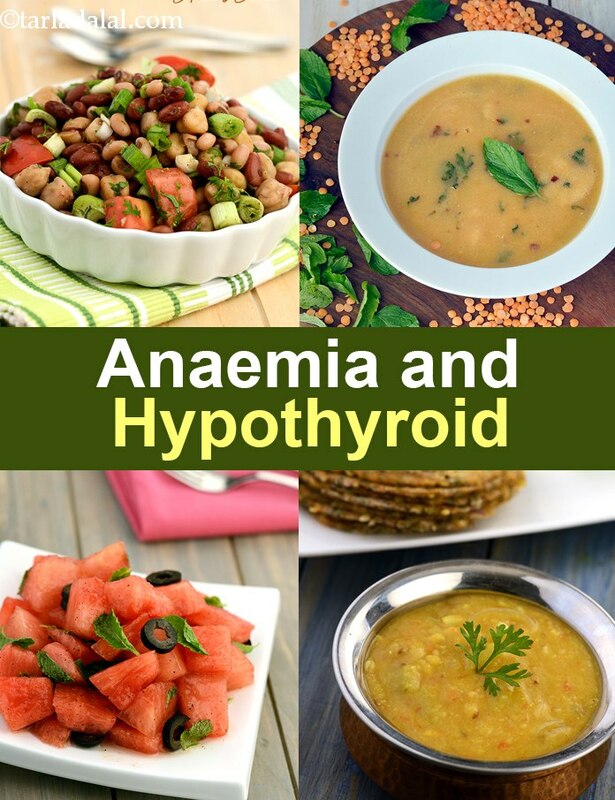 Iron Deficiency (Anaemia) Hypothyroidism Diet, Indian Anaemia Recipes for Hypothyroidism. Hypothyroidism is a condition in which the thyroid gland of our body fails to produce enough thyroid hormone which means it’s not converted to its active form – T3. With the onset of hypothyroidism, the reduced thyroid levels leads to fatigue, dizziness, dry skin, shortness of breath etc. One of the major cause of these symptoms is iron deficiency. How are Iron Deficiency and Thyroid Hormones Related? The reduced thyroid levels leads to suppression of bone marrow activity which in turn may lead to reduced production of red blood cells (RBC) and thus cause anaemia. This may further lead to not enough oxygen and nutrients being supplied to other parts of the body and so you may feel drowsy and tired through the day. In fact, some research also states that iron deficiency can be one of the cause of hypothyroidism. This is because iron is not only responsible for RBC production but also for production of thyroid stimulating hormone (TSH). Hypothyroidism also hinders the conversion of T4 to T3 leading to its decreased levels. Some researchers also believe that women in child bearing stage often have thyroid disorders due to reduced iron stores. Thus the two are inter-dependent. What to Eat to Increase Iron Levels in Hypothyroidism? Well the treatment of iron deficiency is often based on the iron levels in the body. Your doctor may prescribe you iron supplementation. Additionally, you can help yourselves by following an Iron Rich Diet along with foods to manage hypothyroidism. 10 ways to increase Iron Levels in Hypothyroid. 1. Reach out of iron rich ingredients like dals (Dal Moghlai), pulses (Rajma Salad), sesame seeds (Cucumber and Sesame Seeds Salad), leafy vegetables like mint (Minty Quinoa), fenugreek (Methi Moong Dal Subzi) etc. fruits like watermelon (Watermelon and Mint Salad) and pineapple. 2. Enhance your intake of vitamin C as it helps to increase iron absorption. Reach out for lemon juice, grapefruit, berries etc. 3. Do not pair calcium rich foods with iron. It hinders in iron absorption. 4. Limit the intake of caffeine and alcohol as they also impede iron absorption from food and medication both. 5. Foods like spinach, soy and cruciferous veggies like cabbage, cauliflower, broccoli etc. are not very thyroid-friendly. Avoid them as far as possible. Look for other vegetables instead. Try Dal and Vegetable Idli. 6. If you have bloating problem or diarrhea, avoid gluten from wheat, semolina, rye and barley. 7. Oats (Oats Idli), buckwheat, quinoa (Quinoa Avocado Veg Healthy Salad) and brown rice are best cereals to rely on. 8. Weight gain is common in hypothyroidism. So control the fat added to your meals. Also keep an eye on carbs you consume along with a control over the portion size to achieve your weight loss targets if any. 9. Have iodized salt as your thyroid needs iodine to make thyroid hormones. But do not overdo with the salt intake. Just ensure that you aren’t deficient in iodine. 10. Don’t miss out on adding antioxidants to your diet too. Carrot, tomato, capsicum, pumpkin, avocado, cucumber are few veggies you can certainly add on to your pantry. Iron deficiency anemia is reversible and can be treated. The best idea is to meet your doctor and understand this condition very well. Follow it by consulting a dietitian and know the foods that are best for you. Make a list of foods to be avoided and then go ahead and plan your meal. Enoy our Iron Deficiency (Anaemia) Hypothyroidism Diet, Indian Anaemia Recipes for Hypothyroidism and other thyroid recipe articles below.